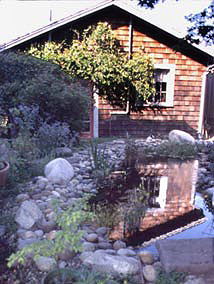 oolscap Press is situated in Santa Cruz along the central California coast 70 miles south of San Francisco. 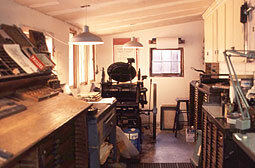 Our printing facility, bindery and home surround our kitchen garden in the summer and bird sanctuary in the winter. 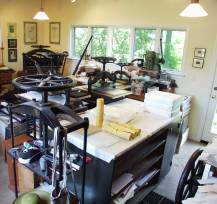 Our pressroom is set up with two platen presses, two proof presses and an assortment of other letterpress equipment. Our books are printed from either lead type or from work generated from the computer and made into photopolymer plates, then mounted for letterpress printing. We have a respectable amount of lead type housed in cabinets, including some old faces no longer available. Our books are hand bound in our bindery which is set up so that we can produce limited edition work for ourselves as well as other fine presses. We are also able on occasion to accomplish portfolio boxes and boxes to house special books for collectors.